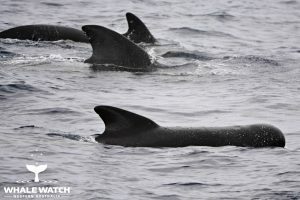 Our first encounter was heartwarming as we sighted the small blows and distinctive movements of Pilot Whales moving through the Bremer Canyon. 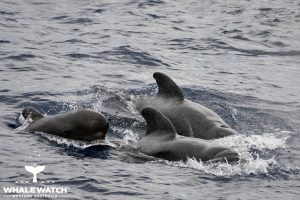 The closer they came the more of them we sighted, literally hundreds of Pilot Whales! 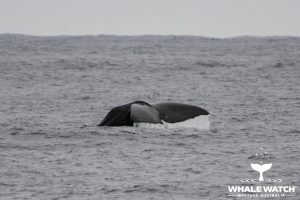 Sadly losing many due to a stranding only a day earlier it was encouraging to sight so many including a brand new calf. 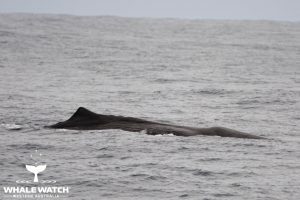 The groups were separated into pods of 80-120 individuals with seven of these pods counted in the area. 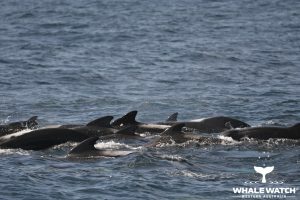 There was also a group of twelve Offshore Bottlenose Dolphins travelling with the Pilot Whales through the Bremer Canyon. 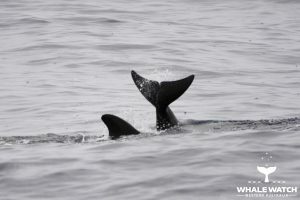 They stayed close to our vessel and we joined the pod as they continued cruising at a steady pace. The young calf stayed close to mum as the younger juveniles tail slapped and swam backwards trying to impress each other. 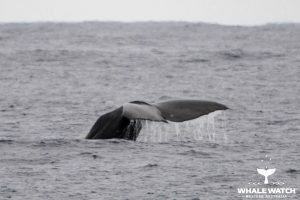 Although hard to leave them we had sighted the muffled blow of a Sperm Whale earlier in the morning and we could see not far away he had resurfaced once again. He logged quietly on the surface as he prepared himself for his next sounding dive by replenishing his oxygen levels. Slowly and very gracefully he lifted his fluke as he disappeared down towards the bottom of the canyon underneath us which was 1.2 kilometres down! 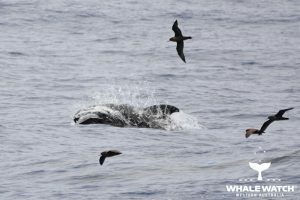 Shy Albatross, Indian Yellow Nosed Albatross, Black Browed Albatross and a juvenile Wandering Albatross followed us throughout the day as our spirits were lifted on the way home to have seen so many happy and healthy Pilot Whales. This post was adapted from a blog, read the original here.